It’s where the crème de la crème of the country’s golf fraternity will celebrate excellence. The very best in the game will get the recognition they deserve. The country’s first golf award ceremony promises to set new global standards. 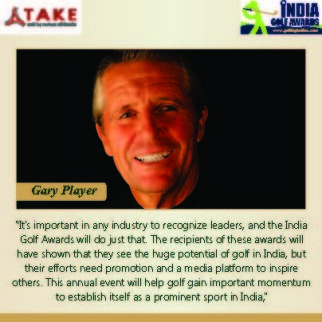 The Take Solutions India Golf Awards will provide a superlative platform for golfing stars from all walks of life. The India Golf Awards in its first edition set new benchmarks and created pathways to bring about positive change to promote golf in a rapidly changing business, leisure and recreational environment. This philosophy and approach only strengthens with the next edition. Golf will grow as India grows and this is an opportunity you cannot miss. An association with this spectacular luxury event will open your brand to new ways of staying dynamic and give it a rare opportunity to present to the sport’s most prolific patrons. Jury Guidelines being prepared by renowned global consultants Technopak who are assessing and formalising all the various parameters basis which players will be short-listed. A narrowed down list with guidelines will be presented to the Jury for final decisions. The awards endeavor to assess golfers on parameters beyond their golf and explore how each one considered for the award are promoting the game and spreading its reach. These are awards for golf leadership. Arjun Atwal, Daniel Chopra, Shiv Kapur, Anirban Lahiri and the top Indian golfers to be present at the Take Solutions INDIA GOLF AWARDS. The champions, all of who have been in the news will lead the mantle from the front as some of the top golfers vie for key honours at the awards. The golf awards are a benchmark in the golf industry and continue to break new milestones with presenting a fair and objective measure for golfers beyond just their money list. This is golf’s annual appointment with a bespoke ceremony to recognise and reward excellence. India Golf Awards will have the full attention of global and Indian media and is going to spread the word around the awards in a big way to promote golf and golf tourism attention towards India. It will have in attendance members of the European Tour, top names from PGTI, IGU and other institutions. TAKE is a global technology solutions and service provider of Life Sciences, Supply Chain Management and Enterprise Solutions. It always looks forward to collaborating and extending mutually beneficial relationships that can contribute towards new innovations, fresh ideas. TAKE’s differentiated work culture is what connects their teams and creates an inspiring workplace. With an aim to bring more visibility for golf in India and place the corporate golf on the global map, TAKE Solutions has been sponsoring the Indian segment of the annual World Corporate Golf Challenge involving 40 commonwealth nations. As part of this initiative, the company is supporting S.S.P. Chowrasia, a professional Indian golfer, winner of the European Tour twice and Khalin Joshi, India’s number one amateur who turned Pro this year. DUSIT Devarana Welcome a whole new level of hospitality and luxury at the new Dusit Devarana New Delhi, a one-of-its-kind urban resort. Eight acres of refreshing greenery and tranquil water-bodies blend seamlessly with award winning architecture. The perfect escape from the tediousness of city life. Yet only a few minutes’ drive from the airport and offices, embassies, shopping malls and markets in Delhi and Gurgaon. If you’re searching for the best that Delhi has to offer in luxury accommodation in a resort-like setting without having to spend endless hours on the road, the new Dusit Devarana New Delhi luxury resort has what you’re looking for. Lufthansa: Nonstop You. That’s the promise of Lufthansa. Being voted ‘Europe’s Leading Airline’ three times in a row by World Travel Awards is testimony to Lufthansa’s quality and reliability. Lufthansa premium services in turn are acknowledged as the veritable gold standard in travel. While the new Business Class is redefining travel comfort with full flat beds, the exceptional First Class was recently honoured with the coveted International Five Star Diamond. A strong partnership with India built over the past 53 years was recently crowned by the introduction of the Queen of the Skies B747-8. Lufthansa now offers 46 weekly flights from 5 Indian cities to 253 destinations in 103 countries. DLF has over 60 years of track record of sustained growth, customer satisfaction, and innovation. The company has approximately 294 msf of planned projects with 47 msf of projects under construction. DLF’s primary business is development of residential, commercial and retail properties. The company has a unique business model with earnings arising from development and rentals. Its exposure across businesses, segments and geographies, mitigates any down-cycles in the market. From developing 22 major colonies in Delhi, DLF is now present across 15 states-24 cities in India. Mizuno is the leading manufacturer of golf clubs, golf balls and golf equipment. Mizuno has a single aim: to deliver the best performing products the game has ever known—products that perform so well, they literally put the joy of the game in your hands. Because the thrills of golf are out there. Mizuno believes everyone with passion for the game deserves the confidence to go out and experience them. Classic elegance and enduring sophistication have always been the basis of the signature Da Milano style, supported with state-of-the-art technology and creativity. Be it Handbags, Portfolio bags, Travel Bags, Wallets or Accessories, our iconic style defines luxury of the highest quality. Our products are exported throughout the world, mainly to Europe where they are showcased at leading department stores. Our patrons comprise of people who appreciate quality leather and also our efforts to produce them in an environment friendly manner. TAKE Solutions INDIA GOLF AWARDS would like to thank its prize sponsors and supporters for cheering the effort of the FIRST ever Golf Awards in India. The eminent list of best pros & amateur players across categories is being organised by India’s FIRST golf portal www.GolfingIndian.com. Like in all global golf awards, it’s the FIRST time a jury of eminent names from golf loving community will choose the best amongst peers. An objective & validated process will choose the achievers beyond normal benchmarks is being put in place by none other than global consultants Technopak. Recognition and reward for golfers across spectrum – professional players, golfing CEOs, entrepreneurs, celebrities, amateurs, women and more. Indian Oil Corporation Ltd. is India’s largest company by sales with a turnover of Rs. 4,57,553 crore and profit of Rs 7,019 crore for the year 2013-14. IndianOil is the highest ranked Indian company in the latest Fortune ‘Global 500’ listings, ranked at the 96th position. IndianOil’s vision is driven by a group of dynamic leaders who have made it a name to reckon with. India’s leading management consulting firm with more than 20 years of experience in working with organizations across consumer goods and services.Founded on the principle of “concept to commissioning”, we partner our clients to identify their maximum-value opportunities, provide solutions to their key challenges and help them create a robust and high growth business model. Building on its group legacy of supporting sports, SRF patronised the oldest professional tournament on the Indian golf circuit, SRF All India Golf Matchplay. The tournament, which was earlier known as DCM Golf Matchplay, continued till 2011. The company’s contribution to the game of Golf is inspired by its founder Chairman, Dr. Bharat Ram, who was a pioneer of professional golf in India. A golfer of repute himself, Dr. Bharat was one of the founding members of Delhi Golf Club and Indian Golf Union. Continuing with the family tradition, SRF’s Managing Director, Ashish Bharat Ram and its Dy Managing Director, Kartik Bharat Ram are also avid golfers and regulars on the golf circuit. 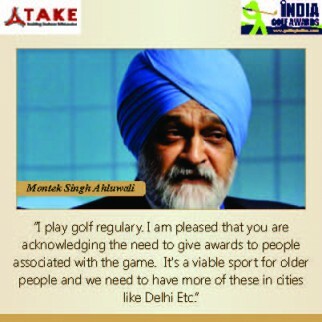 India is all set for the Take Solutions INDIA GOLF AWARDS powered by www.golfingindian.com and supported by most of India’s top golf patrons on Febraury 16th in the national capital. The INDIA GOLF AWARDS are a first and unique initiative because they recognise and award golfers not just from the professional categories but also from the golfing business community, they recognise celebrities and bureaucrats who play the game and reaches out to the industry with special prizes for women, juniors, best golf courses, academies and even real estate around golf courses. Arjun Atwal with his recent big win at the Dubai Open and of course India’s highest ranked golfer in Anirban Lahiri will all be present to mark the second edition of the Take Solutions INDIA GOLF AWARDS. Shiv Kapur, our very own gold medalist in the 2002 Asian games who donned top headlines at the US Open in 2014 and plays in the Asian tour and at the European tour, will be a part of this grand event. Power Minister Shri Piyush Goyal is the chief guest for the evening and also in attendance will be the big names from Indian golf such as European Tour’s International Policy In-charge Ben Cowen, John Boyne from St Andrew’s Professional Caddie Association, top players led by Arjun Atwal, Anirban Lahiri and Shiv Kapur along with special guests of honour and top CEOs. The awards powered by India’s foremost golf site www.golfingindian.com will be the hallmark event starting this year and aims to position itself as a premium event for the game and attract well known players, industrialists, policy makers and avid supporters of the game at a special event in Delhi, to kick off the action at the INDIAN OPEN.